Last Friday I had my heart broken. Not by my husband (thank goodness), but by a much crueler mistress that is the scientific peer review process. Let’s take a second to talk about grad school, if you’ll let me. My “real” job. My day job. As a PhD student in a science discipline you work full time, but there are no set hours. You often have to work weekends and evenings with no one even batting an eyelash. You work to get your experiments done, and the work is never done. There is always another experiment to run, a control that you realized would have been better. You often find yourself working on something to find out what went wrong with the previous thing that you did. Sometimes you lose sight of the larger goal that you started out trying to achieve and get bogged down in a seemingly neverending pile of failures. You work for that one success. That one shining moment where everything you’ve worked toward suddenly falls into place. That one moment is enough to sustain you through the next slew of failures. And that success culminates in a publication. Last Friday I found out that my manuscript was rejected. All my hard work that I poured out on paper, 2.5 years-worth, was not acceptable for publication. It’s hard not to break down, but it’s not in me to quit. Maybe it’s time to pause, take a look at that big picture again, and remember why I decided to devote my life to this work. What made me excited? What made me imagine that someday I would be the one invited to give a speech at a big conference (all expenses paid of course)? Let’s keep it simple and amazing. 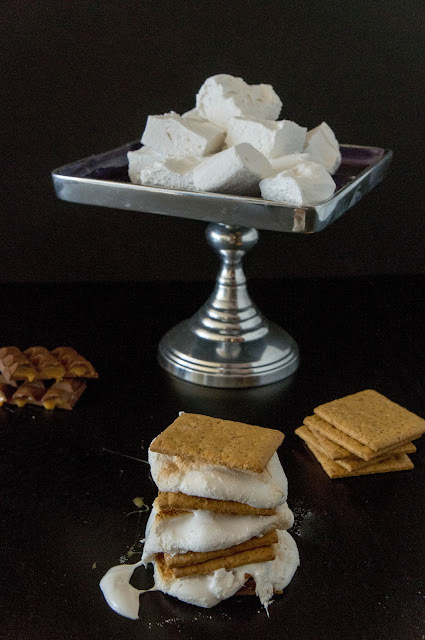 These s’mores are just that. If you’re feeling like you want to make your own marshmallows, I go on about that here. Otherwise this is as simple as it gets. 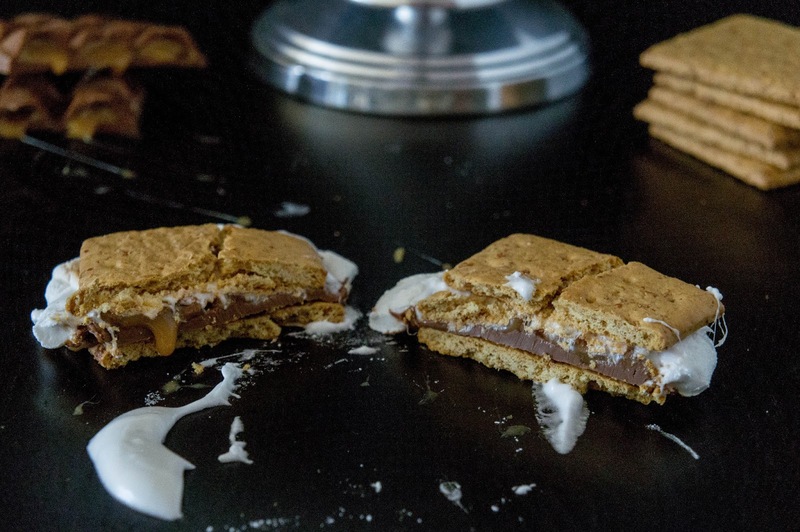 Gooey, roasty marshmallow gets placed upon caramel chocolate squares on graham cracker. A second graham cracker completes the sandwich. You’ll get sticky, and you’ll love it. So take a second and remember why you started doing what you’re doing. I hope you still feel excited to face every day, especially if there are caramel s’mores at the end of it. 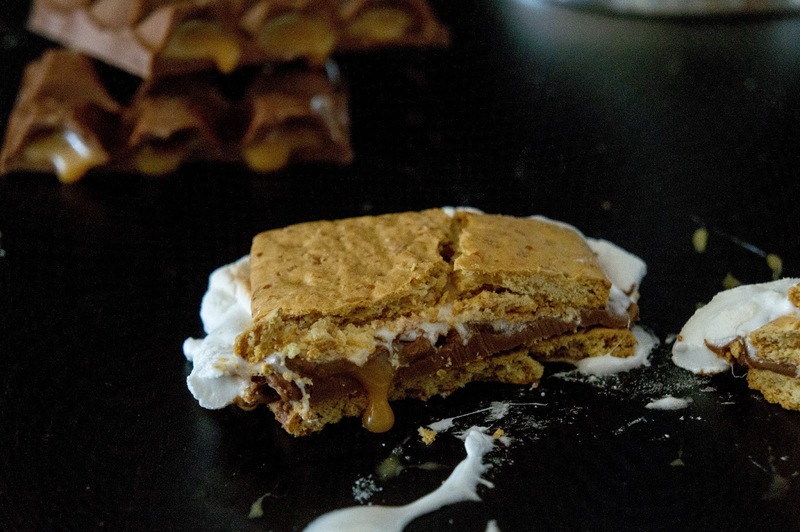 Put a couple of caramel chocolates onto a graham cracker. 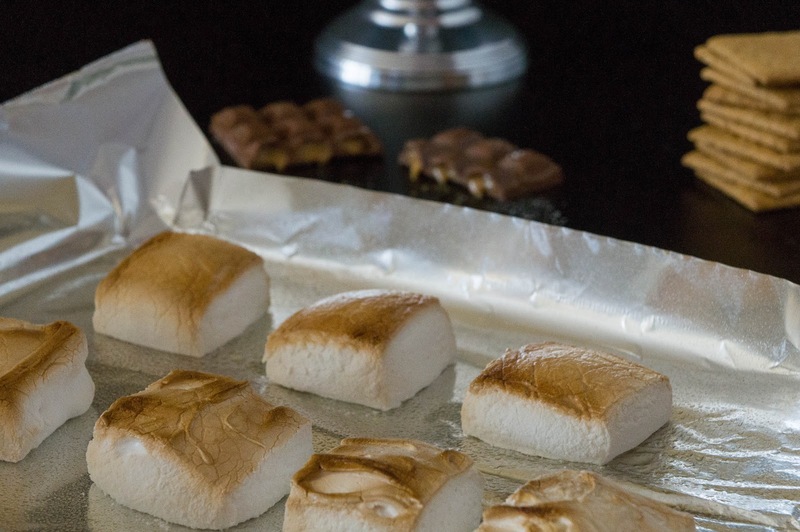 Place warm, gooey marshmallow on top so it melts the chocolate slightly. Top with another graham cracker. Make these as you eat them, they are not as good cold.